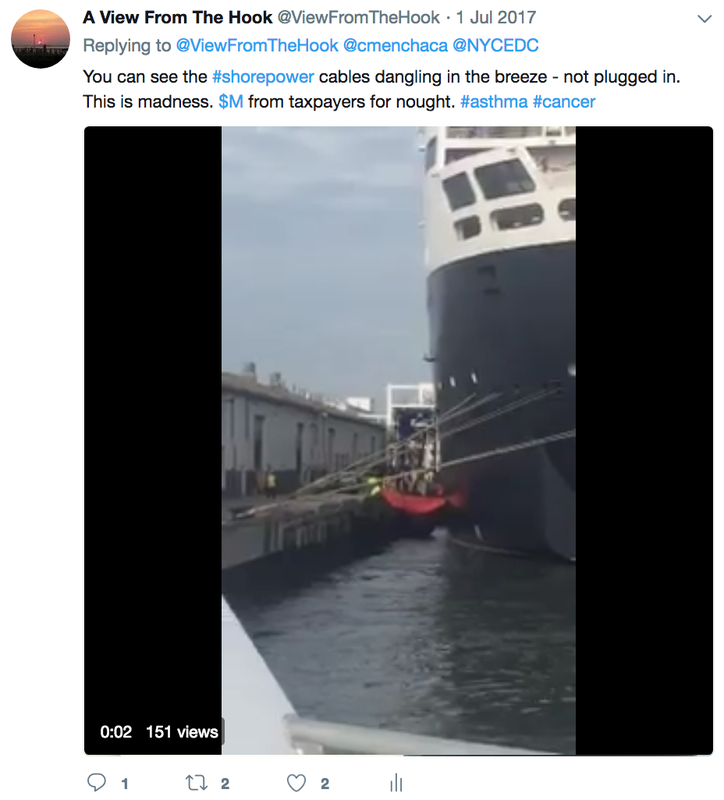 WHY IS THERE NO MONITORING NOR ENFORCEMENT OF THE USE OF SHORE POWER AT THE BROOKLYN CRUISE TERMINAL? 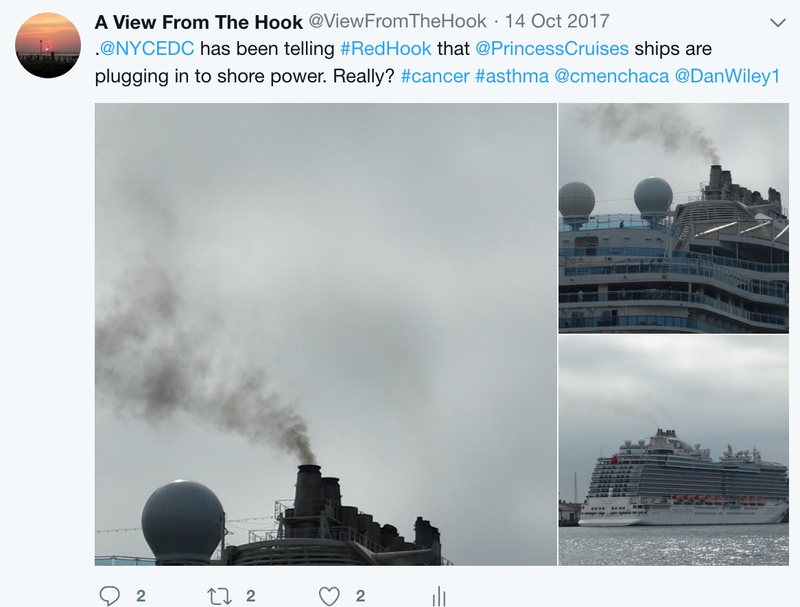 If you've been following me on twitter - @viewfromthehook - you'll know that the NYCEDC has been making excuses all through the 2017 season about why cruise ships have not been plugging-in to Red Hook's multi-million dollar, zero-emissions shore power system. EDC have been telling the public that one ship, the Queen Mary 2, has had "difficulty" plugging-in to shore power (despite the ship successfully connecting to shore power in Halifax and elsewhere). 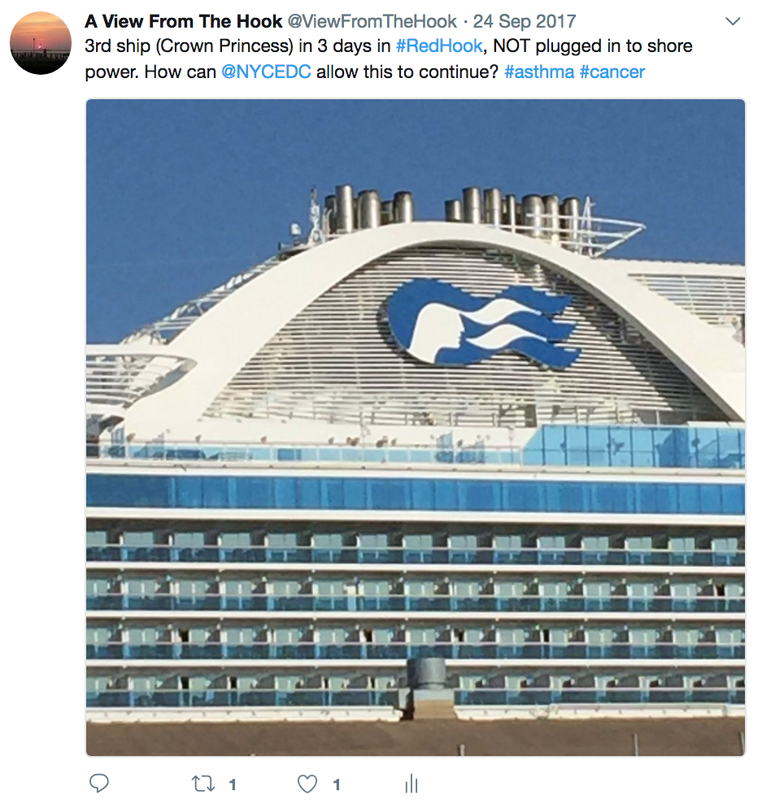 But the EDC also claimed that Princess ships have been connecting to shore power, for the most part, throughout the season. That is just not based in fact. As far as this blog can ascertain, the Princess ships have only plugged-in a handful of times (perhaps only 2 or 3), once on October 26th, coinciding with a press event that included an announcement of the expansion of the Brooklyn Cruise Terminal when Borough President Eric Adams was present. This is actually the only time I can be certain that a ship plugged in. 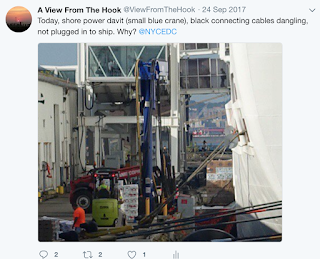 Justine Johnson at the EDC confirmed the connection of the ship to shore power in writing to me and I was also able to take a trip on the ferry and view the shore power apparatus (davit, cables, etc.) in place and connected to the ship, and there were zero emissions visible from the funnels. The only other day a ship was stated to be plugged-in (by NYC Council Member Carlos Menchaca and others) was on May 31st, the day the NYC Ferry landing was launched, when the Queen Mary 2 was in port. On that day, Mayor de Blasio and other dignitaries were present. However, there was no confirmation of this connection by EDC. 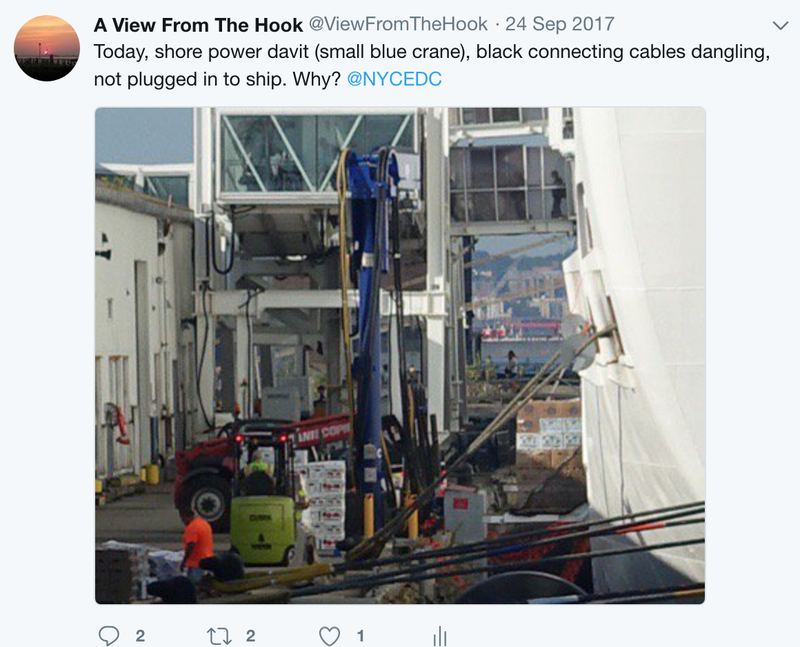 Every other time I was able to check in on a ship docked at the terminal, throughout the season, it was clear that the ship was not plugged-in to shore power. I was able to both see fumes from the funnels, and many times I took the ferry around the stern of the ship and could see the shore power apparatus was not in place and the cables were not connected to the ship. I could literally see the cables dangling in the wind. 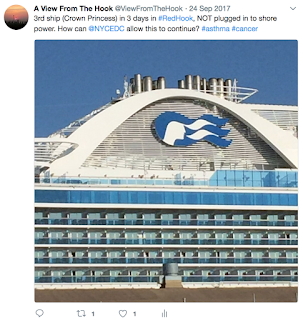 This is what I witnessed with the Princess ships too, which the EDC was telling the public had been connecting to the shore power system. As I said, the EDC has not been truthful. 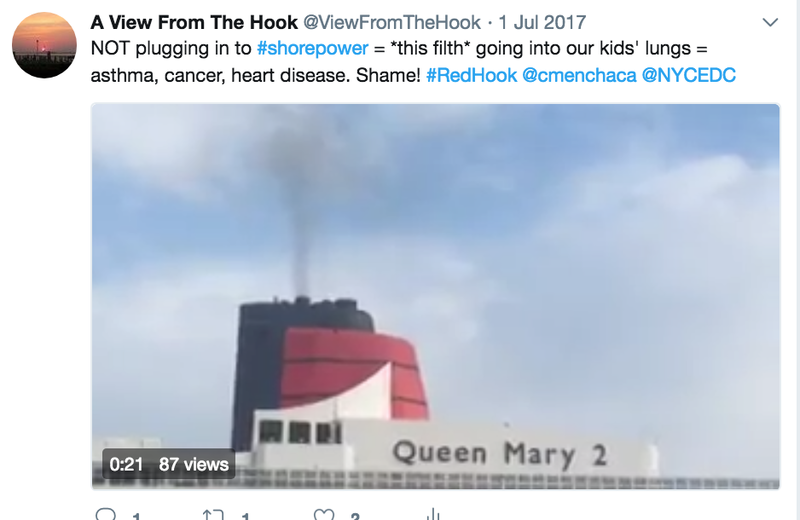 I called City Councilmember Carlos Menchaca one day when a ship was in port and idling, (I can see the funnels from my back yard), and he told me that EDC had not been able to confirm to him that ships were plugging in - they were telling him one thing and the public another. Carlos said that he was frustrated that there was no mechanism to either monitor nor enforce the use of shore power at the terminal. This seems crazy. He did say that he was working on some action that would create an enforcement mechanism, but I'm not sure what that would be and when it would happen. We need to hold to account the EDC, Carlos Menchaca, and all involved, regarding what is happening here. The new operators of the cruise terminal - Ports America - according to press releases by EDC and statements by Carlos Menchaca, have committed to "zero emissions operations" at the cruise terminal. Ports America took over operations at the cruise terminal at the beginning of the season, and clearly that commitment has not been honored. With the announcement, on Oct 26th, of the largest cruise ships - 6000+ passengers - coming to our neighborhood in the next few years, we have to ensure that the promises - and the 2011 formal agreement - made by the City, the NYCEDC, Carnival Cruise (who own Princess and Cunard), Ports America and our representatives are honored, the tens of millions of dollars of investments that have been made to build the zero emissions shore power system capitalized on, and the benefits to our community (less pollution and better health) realized. 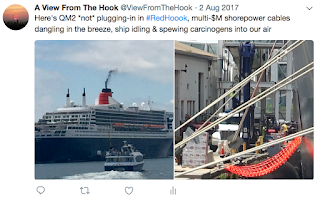 Otherwise, all we'll see is more pollution, more congestion, and zero benefit for Red Hook. Last point - and a bit of background. 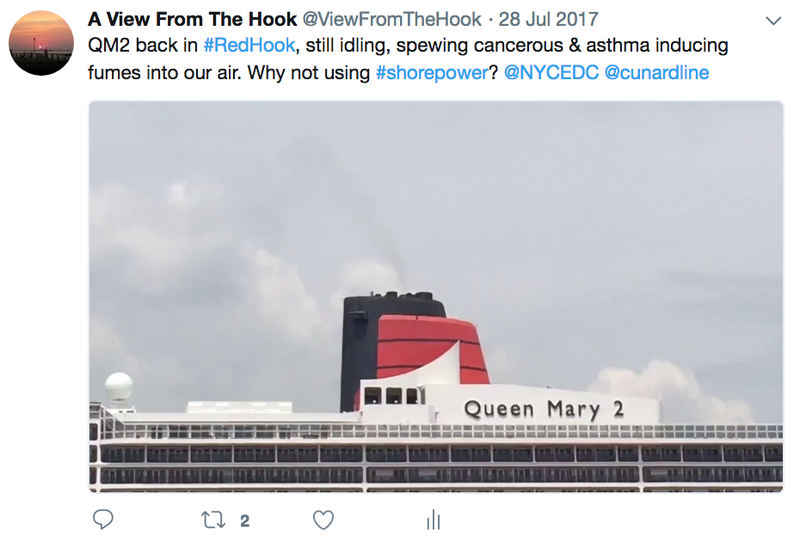 When I first started paying attention to this matter over a decade ago - attending Port Authority, EDC meetings - it was always clear that there was a long term goal to expand the cruise terminal in Red Hook. The Port Authority were talking about building another terminal on Pier 10, and more. 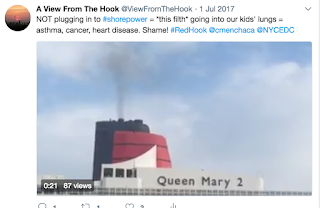 To me, this was extra incentive to get the shore power infrastructure built, so even if we did get more cruise ships, or bigger ships, at least we wouldn't get more pollution. That was the whole point of advocating for shore power in the first place. Now, in 2018, we need monitoring and enforcement of the use or shore power so the benefits of this zero-emissions technology can be finally realized.